Direct-mount - the all vacuum Acromet Series II gas chlorinator is the safest, most reliable way to be sure your water is bacteria free. Simple . . . the Acromet Series II simple design (only 68 parts!) means faster servicing, less downtime, longer life, lower operating costs. Capacities Available: 1.5, 4, 10, 25, 50, 100, 250, 500, 1000, and 2000 PPD. Chlorine gas is never under pressure in the Acromet system. In the Acromet Series II Gas Chlorinator, the gas is drawn from the tank by a vacuum created by the flow of water through the ejector (where the chlorine is mixed with water). If the vacuum line breaks -- if, in fact, any part of the vacuum line is damaged -- the gas shuts off immediately and automatically. So there is virtually no possibility of a leak with an Acromet Series II Gas Chlorinator. The Acromet Series II Gas Chlorinator clamps down directly onto the cylinder valve with a heavy-duty vice-type yoke -- the strongest most corrosion-resistant in the industry. That is a good demonstration of Acromet's "Safety by Design" principle that extends to all the vital parts in the Acromet Series II Gas Chlorinator. Our vital parts are, without exception, bigger and stronger and far more corrosion resistant. Each Acromet Gas Chlorinator is hand-assembled by a highly trained technician who is responsible for in-process visual inspection and bench testing every unit he or she produces. Only when the technician is satisfied with the unit does it go to the Acromet testing room. There it is tested vigorously to measure its operating performance* to check its vacuum integrity, and to make absolutely certain it has no gas leaks. *Performance can be tested against actual operating conditions in the intended application, if data is supplied with the order. 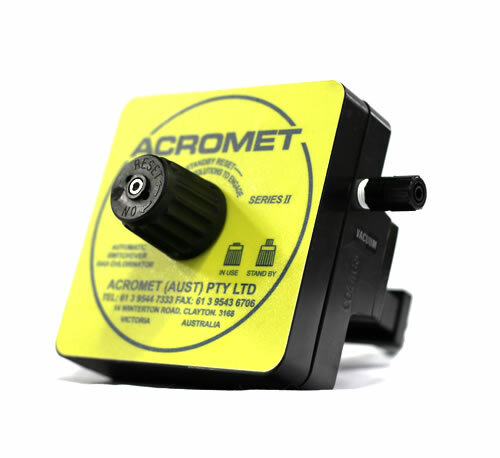 The Acromet Series II Gas Chlorinator's efficient, simple design involves only 68 parts; all made up of quality materials that stand up to wet and dry, and even liquid chlorine. The efficient, high-pressure ejector has 60% fewer parts than any competitors. It is made of fiberglass-reinforced plastic, for strength, and to eliminate cracking. Both the chlorinator and the ejector are so rugged and corrosion resistant, that they need little servicing. When they do, you can take them completely apart and reassemble them in minutes, using only a screwdriver and pair of pliers. Our ejector has a one-piece nozzle and no nuts or bolts. It will not corrode and it will take 200 PSI. The ejector produces higher vacuums at lower water pressures enabling you to use economical centrifuge-type booster pumps. The ejector's unique one-piece high pressure check valve reduces wear or damage from high back pressure, water hammer, or continual on/off operating cycles. Further, where lower back pressures are involved, Acromet offers a valve, which combines a strong closing spring, for a tight seal with a large diaphragm, for minimum friction loss or pressure drop. The Acromet Series II is the one gas chlorinator that offers this choice, avoiding a "compromise" design which inevitably results in leakage, wear, and damage. "Seatless" rate valve can't wear or damage seat. The rate valve seats in most chlorinators are frequently damaged or gouged at low feed rates, or when used to shut off chlorine flow. This cannot happen with the Acromet Series II rate valve, because it does not have a seat. Easy To Service - Simple Design with fewer parts makes Acromet Series II operator-friendly. Only 68 parts compared to more complex brands with as many as 168 hard-to-find parts. MADE IN THE U.S.A. Eliminates Costly Replacement of 3 Critical Parts - In addition to the limited lifetime warranty on the diaphragm and inlet safety valve spring, the inlet adapter is guaranteed against corrosion. Optimises Safety When Changing Cylinders - Containers unique yoke design with chip and corrosion resistant coating prevents unsafe deterioration. Built in yoke handle eliminates wrenches and prevents over tightening. Longer Service Life - ACROMET materials are the most chlorine and corrosion resistant that modern day technology can provide. MADE IN THE U.S.A.
Trouble Free Ejector - Simple one piece nozzle, one piece body, no nuts, no bolts, and 60% fewer parts make it a breeze to service. Reduces Failures Due To CL2/SO2 Contaminates - Reusable plug-type filter removes micro-fine impurities. Eliminates Critical Down Time - Factory rebuild program can be completed in one or two days in emergency cases. Loaner program is available. Less Maintenance and Repair Costs - Fewer parts = Longer life, lower repair costs, and less ``DOWN" time.